Google has released the new YouTube app in its Google+ Hangouts which lets users to add and share videos with their friends in between a hangout. Google has tried to bring the experience of sharing and watching videos together online with family and friends. You can create, control , save and also share the playlists of videos with your friends who have joined your hangout. The best part of the YouTube app for Google+ is that everyone in the Hangout can add or remove videos from the playlists, which makes it more fun and like a real party online. You can sort the playlists and even save it to view later on YouTube. The 'Push to talk' button will enable you to pop in and chat with the group or give props to the friend who added top rated videos. All you have to do is to start a hangout and let everyone load the YouTube app which appears at the top of the screen. Once done, you can start adding your favorite videos and join the online YouTube party. 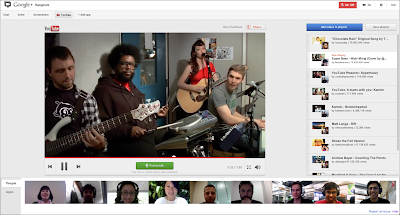 If you like the videos being played inside the Hangout than you can even share it with your circles on Google+. The app has been currently available worldwide in 60 languages. Google has been working hard to make the users stick to its social network Google+. Did you try out this new YouTube app for Google+ Hangouts? Let us know what you think about it in comments!